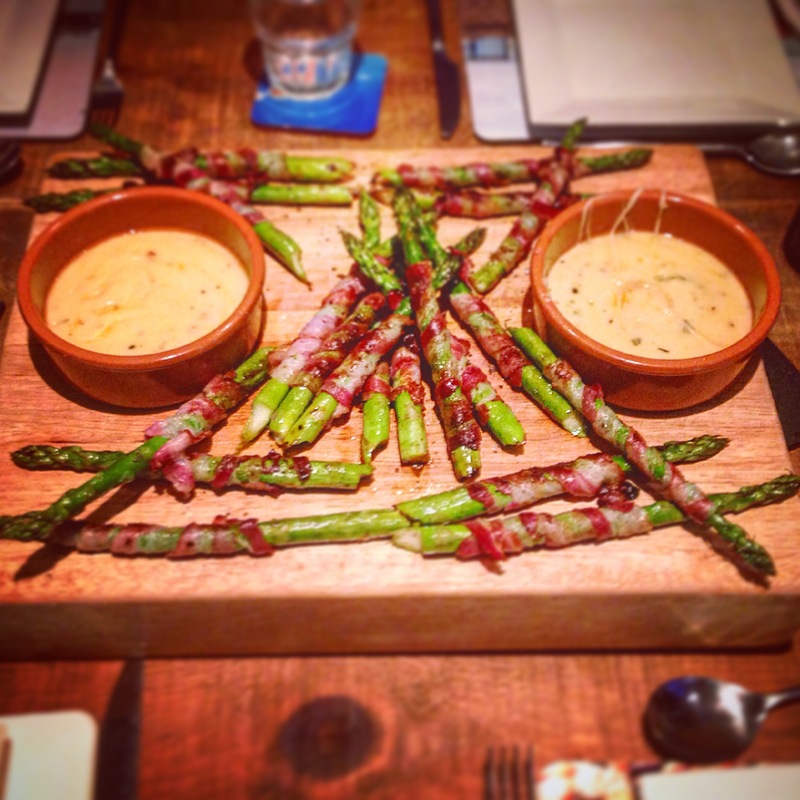 Asparagus and Pancetta with hot cheese Dip sharing board. Asparagus is one of my favourite vegetables and I always think it is grand enough to be the centre piece itself. I made this recipe up when it was Asparagus Season in the UK as a Starter for a dinner party and it became a regularly made dish that guests always ask for more of. It’s pretty simple and doesn’t take long apart from a bit of prep. 1 block of Comte or Gruyere cheese. 1. Break the woody part off of each Asparagus stalk and discard. 2. Wrap a slice of the pancetta around each Asparagus stalk. 3. Drizzle a little olive oil over the stalks, season them with Salt and Pepper and squeeze over half the lemon. 4. Heat up a griddle pan or frying pan. 5. Add the asparagus and fry till soft. If you haven’t enough room in the lab for all the asparagus do them in batches and keep warm in the oven. 6. Next get another saucepan to make the cheese sauce, add the non of butter to melt. The tricky part is to ensure the cheese sauce is thick but slightly runny. 7. Add the cheese. Keep it on a light simmer so you can control the consistency of the cheese. 8. Once the cheese is melting add the bay leaf, thyme, garlic and white wine. Also season with salt and pepper. 9. Try to keep the sauce from solidifying completely as you want it nice and stringy to wrap round your Asparagus stalks when you eat them, if it’s getting too solid you can liquefy a bit more by adding a little more wine. 10. Serve the asparagus in a board in the middle of the table and put the cheese dip into ramekins on the board.